As if being a talented, handsome and charming young performer in metro Atlanta wasn't enough, Gwinnett-based singer Norwood has gone the extra mile to share the rewards of music with youth in our area. Not only has he created a foundation to enhance opportunities in music education and performance, he has also become a spokesman for the Boys and Girls Club's "Text with Respect" campaign this July. Developing his own foundation, Norwood's Noteworthy Noise, came about as a result of several things. "I founded 'Norwood's Noteworthy Noise' because I believe music is an incredibly important part of growing up," he said. "It's through music classes and performing at local venues that I found my true calling in life. I first came to love music and performing as a student." Additionally, music and other arts programs are being cut from our schools, and Norwood was determined to make a difference. "It's heartbreaking to think that a young person may never discover their talents and the joys of making music due to lack of funding for the arts," he said. "I believe the arts influence the culture in incredible ways, and we can't let that end with this generation." In September, Norwood created Norwood's Noteworthy Noise by launching his first event. Partnering with the Peachtree Ridge High School Orchestra, Norwood presented an event at the Red Clay Theatre where students performed classical pieces as well as Norwood's original pop tunes transcribed for orchestra. Norwood also joined them onstage playing keyboard and singing -- but there was more than performing involved. Norwood also led them through the preparation of rehearsal, planning the concert and marketing ideas to help sell tickets. In December, Norwood performed a similar concert with the Duluth High School Orchestra. Proceeds were spent to send these young musicians to perform at Lincoln Center this spring. The next event is at 4 p.m. June 23 at the Red Clay Theatre. Norwood will be performing free of charge in support of another arts group, the Susan Chambers Dance Company. The show will consist of Norwood joined by Mathai, a former contestant on "The Voice," and Riley, who is managed by Elton John's team. Seven of Chamber's hip hop students will perform, plus special guest Sandra Grimaldi-Cauley, Miss Georgia USA 2013. Tickets start at $10 and partial proceeds go to the Susan Chambers Dance Company. Norwood has also become a national spokesperson for the Boys and Girls Clubs of America's "Text with Respect" campaign (TOADD.org), filming a commercial featuring an original song co-written with producer Brad Cox. Norwood will be spending July touring festivals and local Boys and Girls Clubs to help teach kids to use social media wisely. He also encourages fans to sponsor a deserving teen member of a local Boys and Girls Club by purchasing a ticket for them to attend the Summer Pop Fest on June 23. To purchase tickets for these kids or for yourself, visit www.eddieowenpresents.com. Norwood featured on "The Daily Single"
ATLANTA -- On Saturday, Lawrenceville pop singer Norwood performs at Kenny's Alley for the Southeast's largest New Year's Eve celebration -- the Atlanta Peach Drop. It is his first time performing at the event. "I'm very excited about the Peach Drop," he said. "I'm happy to be honored at such a historic Atlanta event. As a native of Atlanta, this is a big deal." 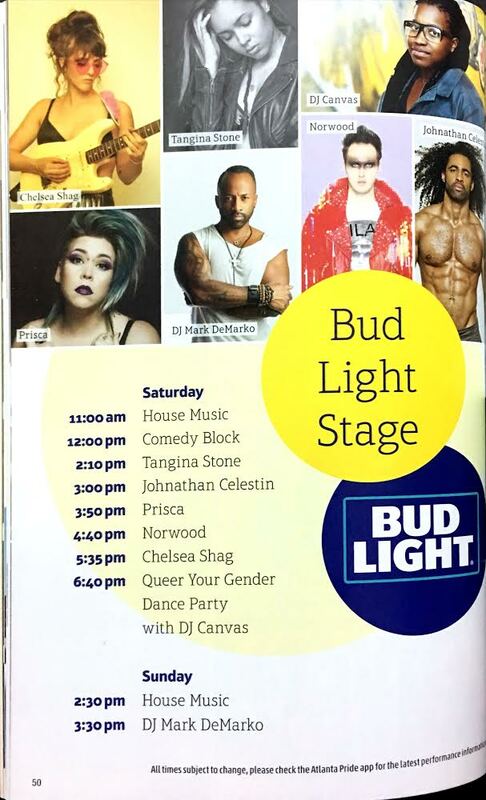 Norwood takes stage at 10 p.m. after Louisiana's Eryn Woods. The 20-year-old singer can't believe he's performing with so many famous acts. "You know, it hasn't completely hit me yet. I imagine it will hit me when I take the stage, but we'll see," Norwood said about performing at the same event as Kansas. At the concert, Norwood is performing three new singles for the public, which he said will "blow people's socks off." The singles will be released on Jan. 1, but if you come to the Peach Drop, you may win one of 500 free copies that will be handed out. There will be other surprises, as well as a full band and several professional dancers on the stage with him. For those who have never heard Norwood's music, he describes it as a mix between Michael Jackson and Justin Timberlake with the "looks of Elvis Presley." "It's very pop but there's a lot soulfulness," he said, "especially in the slower songs." As an all-exclusive sneak peek, Norwood is offering Gwinnett Daily Post readers a chance to download his new tunes for free before anyone else hears them. Those who would like to download the songs should visit www.norwood-music.com/gdp. 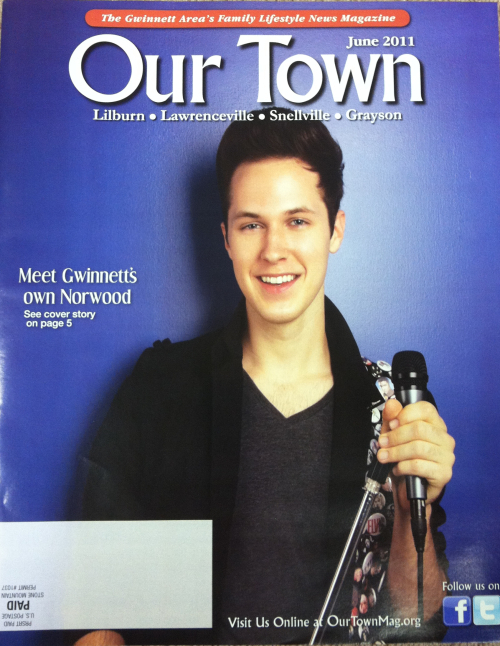 The sweet lulls of this up and coming R&B singer were enough to entice Our Town Magazine to share with the Gwinnett community the journey to fame of this shining star. Meet Norwood - a fellow Gwinnetian with a dream and the unstoppable drive to accomplish it. At just 20 years old, his impressive resume screams talent and heart, a talent that is recognized by some of the best in the music industry. His sweet voice and old soul charm makes him a musician to watch out for in the near future. We guarantee you'll be hearing a lot more about him, not only on OTM but also on your favorite music delivery system. OTM: Who were your early influences growing up? Norwood: There are too many to name! If I had to pick a few, Michael Jackson, Christina Aguilera, and Stevie Wonder were (and still are) big influences for me musically, as were Madonna, Amy Winehouse, and The Beatles. How did you find out you had a talent for singing? I've been singing for as long as I can remember, but I discovered that it was my passion when I went to a week-long music summer camp when I was about 10 years old. It was my first time performing for people, and I was hooked! In 2009, I met my manager, Jayne Madigan, at which time I launched my professional career. She has helped me expand as a singer and a performer, and has played a huge part in getting me to were I am today. What was it like opening up for B.B. King? Opening for B.B. King was an incredible experience - a true adrenaline rush, especially as an artist who had only started his solo career 6 months before. My band and I performed to a sold out crowd, the audience was amazing, and we got to meet B.B. and take a tour of his bus! Did the legend (B.B. King) have any advice for you? He told me to keep following my dreams and to never give up - and I intend to do just that! What was it like growing up in Gwinnett? What high school did you attend? I have many fond memories of growing up in Gwinnett. It's a great place to grow up - there is a sense of community that a lot of other places don't have. I was actually home schooled so that I could focus my time on music and performing, which was a good fit for me. And my first show as a professional artist took place in Gwinnett - the Executive Director of the Gwinnett County Visitors Bureau invited me to perform at a private party in her home. Since that time, I've had the pleasure of performing many shows for my fellow Gwinnettians and sincerely appreciate the continued love and support! I have so many goals for the future; I don't really know where to begin! I want to be successful in the music industry, make great music, tour the world, make people smile, help those in need...my main goal is to live my life to the fullest, and to help make the world a better place for everyone. However, my immediate goal is to record my next single. My new song was written/produced by well-known Gwinnett-based producer, Brad Cox. Our target release date is June 1st, so please visit www.Norwood-Music.com to take a listen and let me know what you think by leaving a comment on my Guestbook. I'm also excited to announce that I'll be spending most of the Summer in the studio recording in preparation for a tour this Fall - stay tuned for more info coming soon. Where can we find more information about you and hear your music? You can visit www.Norwood-Music.com to hear my music, see my show schedule, and connect with me on Facebook, Twitter, Reverb Nation etc. I'm pleased to announce that my first single "After the Rain" is now available on iTunes! During the month of June, ALL proceeds will be donated to the "Plant a Billion Campaign". We will plant 1 tree for each download, so please visit www.Norwood-Music.com to purchase your copy today for ONLY 99 cents and help save the environment. NOTE: "After the Rain" is my first single that was released in November 2010 and written/produced by famed LA producer Steve Dorff. Dorff has worked with many national artists such as Celine Dion, Whitney Houston, Ray Charles, and Barbra Streisand just to name a few. What would you advise young artists who have big dreams here in Gwinnett? Just keep working hard! Network with like-minded people in the business, find a reputable management team that has your best interests at heart, make sure your live performances are memorable, and never give up on your dream!